Composer Frank Wildhorn (born 1959) is, like Andrew Lloyd Webber in his day, loved by the public and hated by the critics. In spite of the huge success of Jekyll and Hyde (1990) on its four-year Broadway run, and his generally prolific output (in 1999 he was the first composer in 22 years to have three shows running on Broadway: Jekyll, The Scarlet Pimpernel and The Civil War), he has never gained critical respect. This trend has continued in recent weeks with his latest offering, Wonderland, which opened on Broadway (following a Tampa world premiere in 2009) to largely damning reviews in mid-April and has already closed. The show is a new spin on the classic Alice in Wonderland story, whereby a modern-day woman goes on an adventure below the streets of New York and meets a range of characters who 'help her discover what's really important', as the press release describes. Remarkably, the ever-resourceful Sony's Masterworks Broadway label have shown undying faith in the project and recorded an original cast album in March. The recording suggests that although it's no My Fair Lady, the show is lots of fun and deserved to play longer on Broadway. Wildhorn's score is characterised by an eclecticism of style. At times, it sounds like a lively contemporary pop musical, such as in the rousing ensemble 'Through the Looking Glass'. Then there's the jazzy solo 'The Mad Hatter', which is a rousing highlight, while Alice 's 'Finding Wonderland' and Chloe's 'Home' are touching ballads. 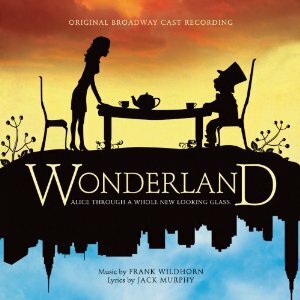 Unquestionably, Wonderland doesn't have an arty outlook, and it's no Sondheim masterpiece, but it's not meant to be. To my ears, it's a lot more interesting and enjoyable than Sister Act or Priscilla, two far-more-successful shows of the current season, and it deserved to do better. The album benefits from a number of lively and committed performances, including Janet Ducal's Alice, Darren Ritchie's Jack, E. Clayton Cornelious's Caterpillar and Kate Shindle's Mad Hatter. Masterworks Broadway has done an excellent job on the release, with a lavishly-designed booklet and complete lyrics (though I wish a synopsis had been included). It's excellently recorded by producers Wildhorn, David Lai and Jason Howland, and overall, it's well worth a listen. To complement the release, the label has brought out an album of Wildhorn's songs sung by Linda Eder, his ex-wife. Aside from their personal connection, the pair have performed together many times and Eder clearly feels very deeply about this music. The twelve songs on this album, entitled Now, range from the emphatic 'Living in the Shadows' from Victor/Victoria to the catchy 'Mad Hatter' from Wonderland. Along the way, there's slightly unusual songs from shows like 'What's Never Been Done Before' from Camille Claudel and 'No Finer Man' from Cyrano de Bergerac, plus songs that were written especially for Eder, such as 'Ordinary People (by Wildhorn and Brenda Russell) and several big band numbers by Wildhorn and Jack Murphy (lyricist of Wonderland). Clearly, Wildhorn's many fans are going to love this album, but for me it suffers from soupy arrangements, an echo-ridden acoustic, and, I'm sorry to say, a slightly generalised approach by Eder. To my ears, her pitching is not always accurate, and she doesn't produce a wide enough range of vocal colours to enliven the music. Therefore, this is probably one for fans only. Wonderland, meanwhile, ought to have a broader appeal, and it's to be hoped that it fares better on its post-Broadway tour.